The boat to Uruguay did eventually arrive. We took our seats in Business Class and drank champagne, because we had obviously earned it. The ferry ride from Buenos Aires to Colonia del Sacramento, Uruguay isn't long, but you lose an hour when you get there. We passed our time on the boat by having lunch and basically just hoping we would have time to see something once we got there. And just like that, we were in Uruguay. Colonia del Sacramento is extremely old. It was founded by the Portuguese and has what I suspect to be the typical story of colonized towns. There were battles and sovereignty changed hands - repeatedly. Now part of the city is a tourist attraction full of cobblestone roads and structures that have stood for hundreds of years. I loved it. The visitors' center was extremely modern. We were in too much a hurry to stay long though. The entrance. It was once a proper drawbridge. 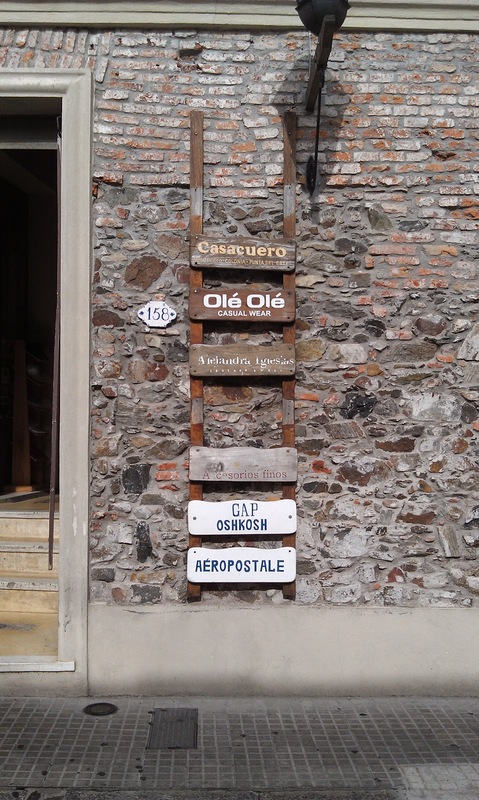 Every classic town needs a Gap. It was around this time that I think Ang began to realize another of my shortcomings. In addition to being unable to keep track of my debit card, I am not good at taking proper pictures. Sure, I can hold a cell phone and find moments. But when it comes to holding a real camera and taking a picture that needs composition and... well... other stuff, I am useless. First of all, Ang's camera is intimidating. It has knobs and buttons and circle bits that turn. It's heavy, yet dropping it is not an option. I don't even want to out it down on surface when I have it. So that ups the ante a little. Also, when I look through the viewfinder, my only thoughts are "steady," "is she even in the picture?" "push the button," and "return the camera safely." The other things that go into taking photos (read: everything that goes into taking a photo) just flies out of my head. And gave me the okay to tweak settings and use the manual focus. And I understood what she wanted. Yet every time she gave me the camera, I blanked. So if you never see a picture of South America, you only have me to blame. We did a thorough tour of the old town, then walked through a more modern area where we remembered that we should have been buying souvenirs during the previous week. I bought prints that inspired me to repaint my living room. The day had taken a considerable turn for the better, you know, once we actually got where we were going. We were pretty early for the ferry back to Argentina. We just didn't have time to start anything else after souvenirs. 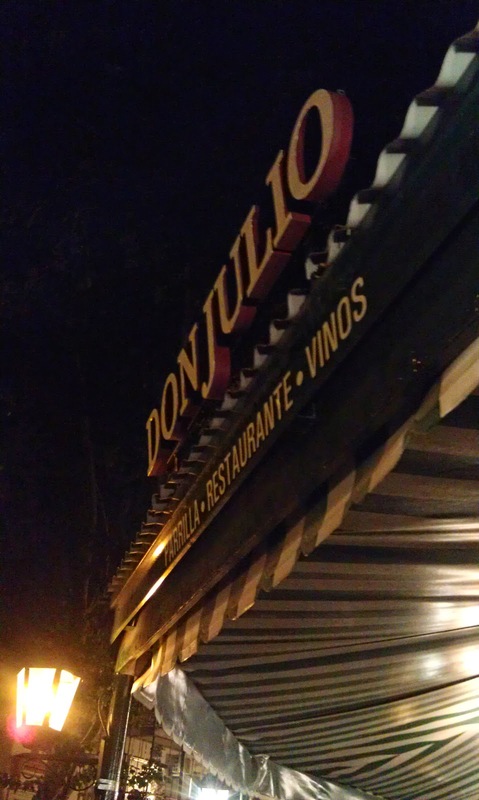 The ride back to Buenos Aires was uneventful and we decided to return to Don Julio's for our final dinner. I admit, it was nice to get back into town after 10 and feel "right on time" for dinner. Buenos Aires served us well. It also spoiled me, with our studio apartment, Wi-Fi and general stability. I felt comfortable there - as if I were a resident. I think of our time there as "the vacation before the trip." It's difficult to explain why. But I think I can do it.